So today is publication day for Ragdoll (WOOHOO!!!) and I’m delighted to be taking part in the release blog tour blitz and resharing my review for one of my favourite reads of last year!!! Every news bulletin and headline is obsessed with this story. Your friends, your family and your neighbours are all talking about it. I had seen Ragdoll on social media in recent weeks and immediately added it to my watch list, and I am so glad I did because it is absolutely brilliant! I love gory and gruesome in books, and I make no apologies for that, so to open with a body made up of different peoples body parts definitely grabbed my attention! So much so that I devoured Ragdoll in less than 24 hours, I just couldn’t put it down. When I was raving about it to my husband, he said it sounds like it could be a movie or a tv show, and that’s exactly where Ragdoll’s background is. 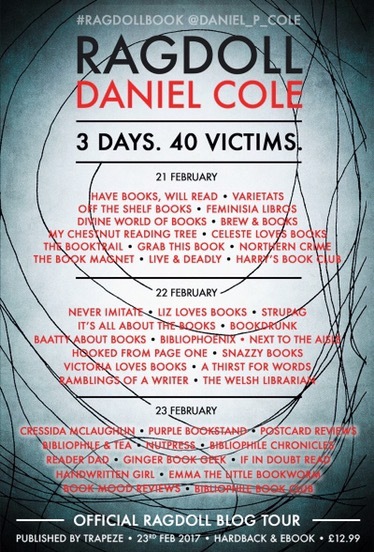 Daniel Cole has effortlessly transformed his writing into a gripping, twisted game of cat and mouse between the pages. The characters are all really well written too. I am super excited to read more about Wolf because he is by far the most interesting and beautifully flawed Detective that I have encountered in a long time. And don’t even get me started on the Ragdoll Killer because that is one twisted antagonist, in the best possible way. I don’t want to give too much away about the story, but it went in directions that I just wasn’t expecting. I found myself questioning everyone’s motives and I’m pretty sure I got it wrong every time! To say I enjoyed Ragdoll would be an understatement! It consumed me while I read it. Definitely one of the best crime books I’ve read in quite some time, with an excellent premise and some darkly humorous moments I cannot recommend it highly enough! One to watch for certain!